At Rove Concepts, we strive to deliver your purchase with excellent service and flexibility, every time. Rove's Delivery Service is more than just the safe transportation of your purchase – it's a commitment to your satisfaction. We offer a comprehensive service designed to handle every detail and give you a seamless experience. We want to send your order to you as soon as possible on a day that works for you. For your convenience all items within an order will be shipped together and we will provide an estimated delivery timeline when placing the order. Once this shipment has reached the local terminal closest to your location the carrier will call you directly to plan for delivery to your home or business. Upon delivery, be available to accept the shipment during a scheduled 4 hour window period. If shipped with UPS or a small parcel carrier your delivery will occur as per tracking details rather than scheduled directly with you. Visually inspect the packaging and be sure to note any issues along with your signature on the delivery paperwork. There may be additional costs for adding to your order after it has been prepared for shipment, for evening or weekend delivery, and depending on your area weekend delivery is not always available. If you have selected pick-up for your order, we ask that you to wait for a confirmation call from the warehouse before going to collect your order. While the large majority of our orders arrive within the lead times shown, shipping times are only able to be good faith estimates due to multiple variables during transit. Roveconcepts.com is not liable for any loss, damage, cost or expense related to any delay in shipment or delivery, and we are not able to ship to PO boxes. Standard Shipping includes a delivery to the threshold, described as the "first dry area or garage" or lobby/service area of a high-rise building, unless shipped with UPS or a small parcel carrier for which a signature will be required upon delivery. Please note that stairs to the front door or first dry area are not included with this delivery service. White glove service includes a delivery appointment, inside delivery up to 1 flight of stairs, placement, assembly and removal of large packaging materials. Please note, this service does not include assembly for bookshelves/ shelving units. For customers located close to our warehouses we are pleased to offer free customer pick up! Our US warehouse is located in Buena Park, CA and our Canadian warehouse is located in Richmond, BC. During checkout if a shipping address within California or British Columbia is entered our system will automatically offer customer pick up as a shipping option. While the lead time is typically shorter for this option, please note that orders will not be ready for pick up within the same day and you will be notified directly as soon as your order has been prepared. Full warehouse address and contact information will be provided on your order invoice, with pick up available during weekdays only. Orders can only be held for pick up for 15 calendar days so please notify us if you require further time, storage fees may apply. If a third party will be collecting your order please notify us in advance and ensure that they bring photo ID or our warehouse team may deny pick up. We recommend bringing a larger vehicle and a friend to help carry the order, as our warehouse team will not be able to assist with loading. Flat rate shipping - All orders will be delivered for a flat fee to anywhere in the US and Canada. Customers may choose to upgrade to optional white glove delivery. Please note, deliveries to some remote areas may be charged extra. Our carriers will make every attempt possible to accommodate customer requests for delivery dates and times, but reserve the right to refuse specific days of the week based on availability and routing. Shipping prices are calculated on website prices before coupon codes are applied. Shipping charges are non-refundable once items have left our warehouse, including damaged or defective shipments. Any additional charges accrued with the delivery company will be transferred to the customer. These include, but are not limited to, isolated zip or postal codes (e.g. back road, islands etc. ), missed attempted delivery charges, weekend delivery, storage fees, additional delivery services and other potential charges associated with the order. Once an order has been set up for shipment we cannot accept any changes to the product(s) ordered. Shipping to Hawaii, Alaska and Puerto Rico is not available, and shipping outside of Canada and the United States is not available. It is the customer's responsibility to keep track of the order from shipment to delivery. 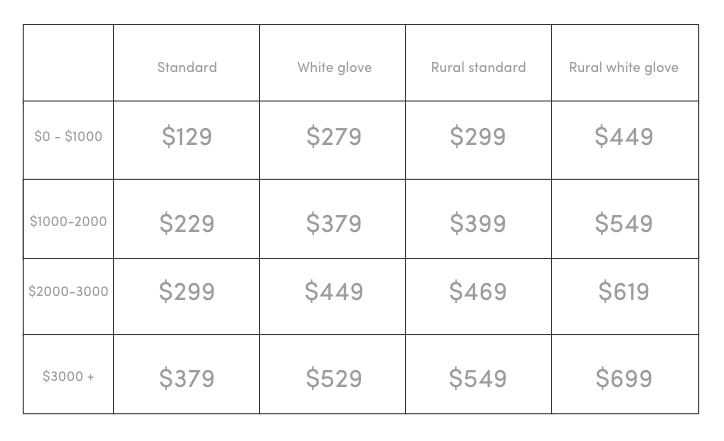 Once an order has been shipped, an upgrade to White Glove Shipping will incur a significant surcharge to the customer, with an understanding that the arrangement will cause delays in shipping times and is not always available. White Glove service is only available to certain areas in Canada but is available throughout the US. Please consult customer service to inquire about your area. Full payment is required for custom orders. Once production has commenced all costs of production have been incurred therefore a cancellation request whilst an order is in production would result in only 50% of the amount paid being refundable. The custom order lead time is an all encompassing 8 - 14 weeks. Production and delivery lead times are estimates. In the unlikely case of a custom order exceeding 24 weeks from the date of the deposit, the customer has the right to cancel the custom order for a full refund or the deposit. The Rove Guarantee applies to custom orders only to the extent of defects or damages. Custom orders are not able to be returned or refunded based on buyer’s remorse. If the customer is unable to take delivery of the order’s item within 15 days of being contacted that the items are ready to ship, warehouse storage charges will be applied to the customer. If the customer is unreachable by phone and/or email, unable, or unwilling to take delivery of the items after 15 days of Rove’s effort to inform the customer of delivery, the customer forfeits the non-refundable deposit paid and Rove has full discretion on how the order’s items are to be handled. Orders in stock take approximately 24 - 48 hours to be set up for shipment. A shipping order will be created from the delivery company to pick up the order at which time a tracking number will be created. The tracking number and other tracking information are provided via email within 2 – 4 business days. If there is a specific time period when you may not be able to accept delivery, you must notify us at 1-800-705-6217 before placing your order to discuss the possibility of delayed delivery. If you learn of a delivery conflict after placing your orders you must notify us prior to shipment. Temporary storage may be possible, but storage fees will apply on a per day basis and at the cost of the customer. Consignee changes require written notice 5 business days prior to shipment. If the customer is unreachable by phone and/or email, unable or unwilling to take delivery after 30 days of Rove 's efforts to inform the customer of delivery, the customer forfeits the order along with any balance paid, and Rove has full discretion on how the order 's items are to be handled. You may login using your email address and chosen password to view order history, print receipts, and pick up tracking information and details regarding your order. You may also email customercare@roveconcepts.com or call our Order Status Department on 1-800-705-6217 x 2. For purchases in Canada, the province or territory that the order is shipping to will determine the sales tax applied to your order. For purchases in the USA sales tax will be applied to orders shipping to the state of California or as required by law. Promo codes and vouchers for store credit are limited strictly to one per order. Promotional exceptions may apply. Trade Program discount cannot be applied in addition to promo codes. Vouchers and store credit are valid for one year unless otherwise stated and can only be used for furniture items, they cannot be applied to shipping charges or accent items such as accessories and lighting. A review credit can only be applied once per customer account. If a promo code or voucher was missed from the order that has already been placed, we must be notified within 72 hours or the promo code/voucher cannot be added/adjusted. Your credit card will be automatically charged for outstanding payments, including but not limited to overdue invoices, additional carrier charges, and storage fees. Once a transaction has been completed, there will be a charge of 3% of the transaction amount for changing credit card information or the charge amount. Please note that for pre-orders awaiting backordered items, the full payment will be charged upon placement of the order. Coupons/discounts may be applied within 24 hours of ending, or up to 72 hours for price adjustments on orders that have already been placed. Both the currency and tax for payments are based on the Shipping Address, if an order is shipping to Canada and the billing address is in the USA the card will be billed in CAD with provincial taxes and vice versa. Please note that additional admin/exchange fees may be charged by your credit card provider. We do not accept cheques with a billing address outside of the US or Canada. In placing an order, you warranty that you are over 18 years of age, and that you are providing accurate, true and complete information, and that you have the authority to place the order. You expressly understand and agree that your use of this site is at your sole risk and that this site is provided on an “as is” and “as available” basis. Roveconcepts.com makes no representations or warranties of any kind, express or implied, as to the operation of this site or the information, content, materials or products included on this site except otherwise stated in our 5 year limited product warranty. You agree to indemnify and hold harmless Rove Concepts and roveconcepts.com and its officers, directors, employees and suppliers, from any claim, demand, action or damage, including reasonable attorneys' fees, made or incurred by any third party arising out of or related to your use of this site. You are responsible for maintaining the confidentiality of your account and password and for restricting access to your computer. You agree to accept responsibility for all activities that occur under your account or password. If you are under 18, you may use roveconcepts.com only with involvement of a parent or guardian. Roveconcepts.com reserves the right to refuse service, terminate accounts, remove or edit content and cancel orders at its sole discretion.